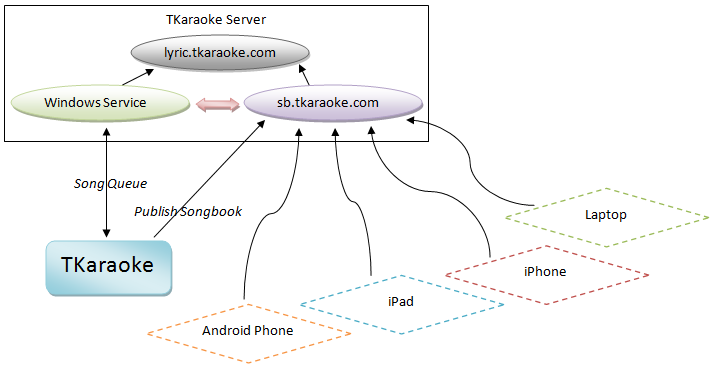 Starting with v1.5.022, TKaraokePro will support online songbook where you can control the Song Queue using your mobile device like iPad, iPhone, Android, Black Berry, Laptop, or another computer. 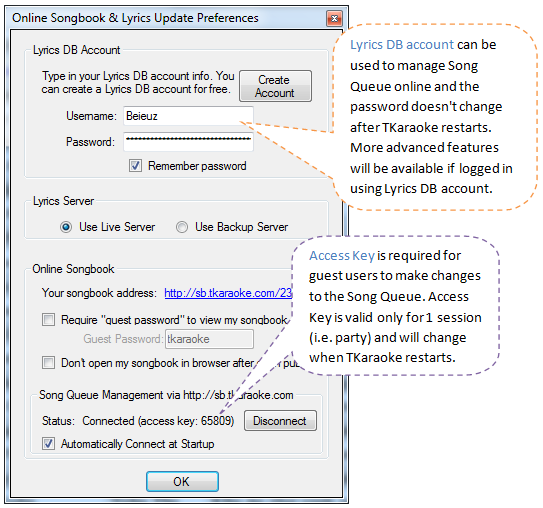 To make changes to your song queue, you need to log into the Songbook web site. 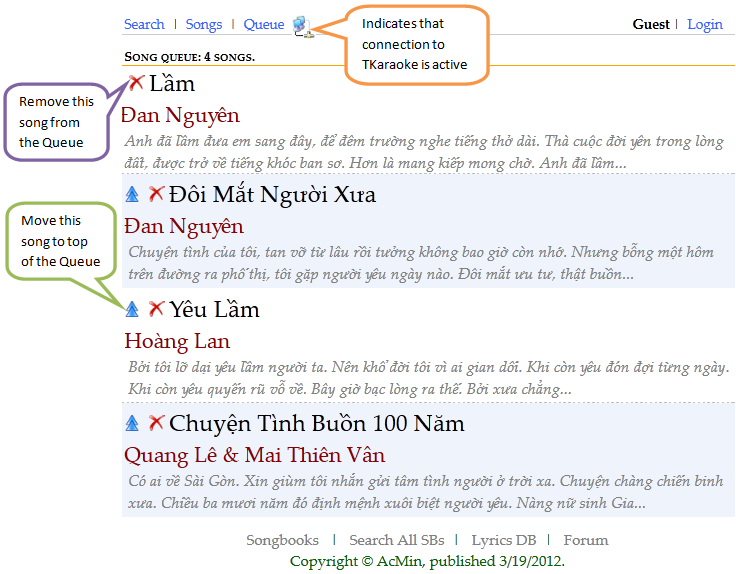 Typically, for your own use, you use your Lyrics DB account to login. For guests to your party, give them the Access Key to queue up their favorite songs. 9 users thanked Hai Lúa for this useful post. How does the search result sort, in what order? from my result, I assume it sorts in numerical order. Can user sort the this? If not, it would be easier if the result sorts in alphabetical order (of the titles)..
Also, for now, we have control functions SKIP and "REPLAY", in the future, can we have all the control functions add in too? So that it's similar to a control app, users can fully control TK from it, don't have to use remote or keyboard anymore. Agree with what part? The search result sorting or the pause/play/mute/volume/etc. controls? 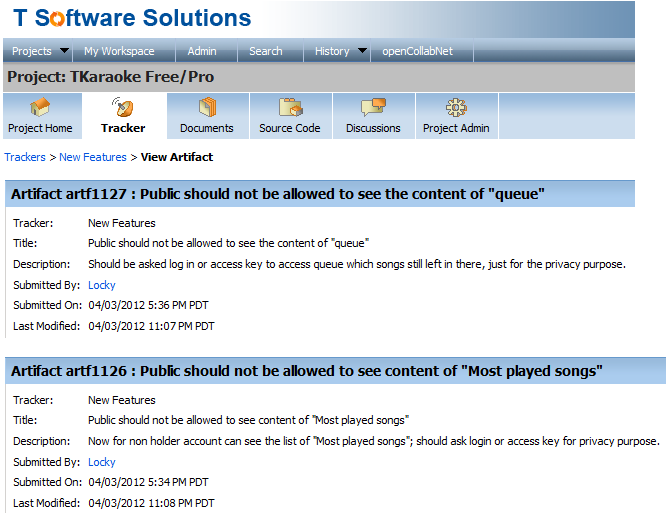 I'm really impressived with the Online Songbook with remote Queue Management. But, I want to rip off the remote control completely. Please also add the Pause/Play/Replay/Skip/Mute/Volume/Toggle Audio buttons to the online songbook. Replay and Skip are already implemented as of v1.5.023. Great work DJ! I've just purchased Pro code and can't wait to upgrade my Tkaraoke to Pro and play around with the new online control. PM me if you don't get your code within 24 hours. 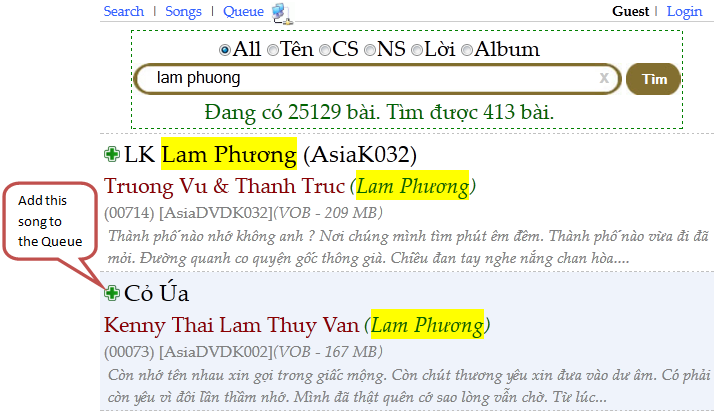 Anh Locky open 2 trackers nói là khi publish songbook to the public (not using the password protected option provided by TKaraoke), the Song Queue and the Most Played pages should not be visible to the public. Is this the behavior we want? One school of thought is "if you want to be hidden, you should protect your songbook with a password". Another school of thought is "I want my songbook to be public but not my currently playing songs (queue) and my play statistics (most played)". Need some opinions here on this topic before we accept or reject these two trackers. Ya, I agreed we should take a poll for these. To me I publish my songbook without password because I want to public has ability to search the songs to compare with their songbook. ( I always go to someone's songbook to search the songs which I did not have, so I can find the download for that songs). Just for the privacy and political (I think you understand what I mean?) I don't want to expose songs in "Most played songs" and queue to everyone.